Sony announced the PlayStation 4 Pro – a 4K, HDR-capable version of the PS4 – at an event today held at the PlayStation Theater in New York City. 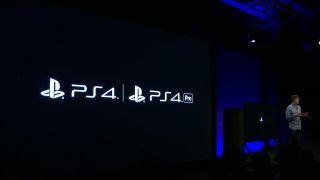 Group President and CEO Andrew House told the audience that the console will exist alongside the PS4 Slim which, House says, is "the standard system going forward." The PS4 Pro's benefits include 4K/HDR gaming, as well as 4K media streaming from apps like Netflix. According to PS4 chief architect Mark Cerny, the system's additional processing power will enable developers to add additional particle effects and higher-resolution textures to games, and should require little effort on developers' part to implement. While we originally believed the PS4 Pro would compete against Microsoft's Project Scorpio, announced at E3 earlier this year, the Pro seems more in line with the Xbox One S which launched last month. Both systems can play media in native 4K and will benefit from high dynamic range technology that allow an expanded color gamut to be displayed on HDR-compatible TVs, but only the Pro can play games in 4K. The trade-off here, though, is that Sony's new system won't include a built-in 4K Blu-ray player – an odd move considering Sony's heavy investment in the medium. The PS4 Pro will work with every original PS4 game out already and all those made in the future, however developers will be enable a "Pro Mode" that will add the aforementioned particle physics and high-res textures. A number of developers have already said they'd support the new hardware, including Sony Interactive Entertainment's Bend Studio and Infinity Ward, the team behind Call of Duty: Infinite Warfare. "The PS4 Pro will support richer textures and 4K graphics on top of 60 frames-per-second gameplay," said Andy Hendrickson, CTO of Activision. Clearly the system's strong suit is 4K. Beyond 4K Ultra-HD gaming, though, the PS4 Pro will also be capable of 4K video streaming through an updated Netflix app which will be available at launch. The additional processing power should also make gameplay and media on the upcoming PlayStation VR headset smoother as well – something House mentioned at the beginning of the press conference but never returned to. What's more surprising, though, is that House made no mention of there being a 4K Blu-ray player inside the Pro – a potentially major oversight should that be the case. Microsoft decided to include the hardware on the recently released Xbox One S, making it one of the cheapest entryways into 4K Blu-ray. We've reached out to Sony to confirm whether the Pro will include the hardware or not, but at this time the outlook is bleak. So when can you look forward to jumping into the Ultra-HD world of 4K gaming? The PS4 Pro will be available on November 10 for $399 / £349.